The End of the Beginning. A New Journey Awaits! For everyone else... THANK YOU ALL SO MUCH! ONE MILLION DOLLARS! Dr. Evil would be jealous!!! It’s difficult to put into words how grateful and awestruck we are for your support and continued interest in our endeavour, Project Phoenix. 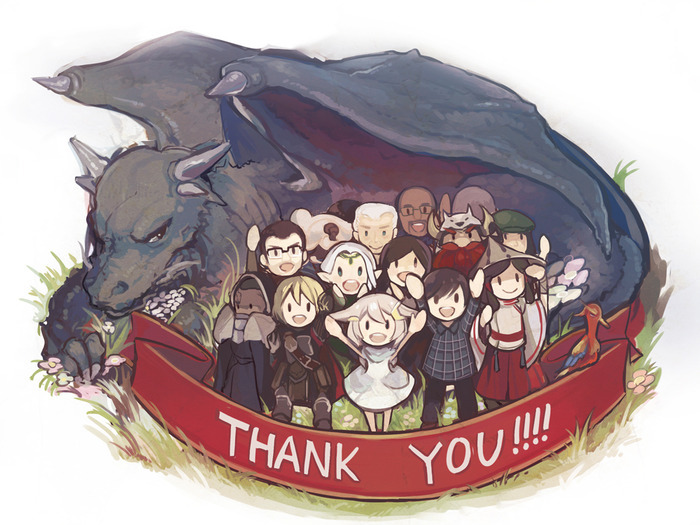 What started as little more than a spark of hope and memory of JRPGs in days gone by has, thanks to YOU, become a blazing reality. Quite literally, our dream meant nothing if people didn’t share our belief in it, and it is overwhelmingly clear by the figures generated in just a month that so many of you want Project Phoenix to take wing as much as we do. Now that you have so loudly declared your support, it is our promise to you that we will work ceaselessly to ensure that Project Phoenix is as awesome as it can be. One last Stretch goal passed! We’d like to point out another important event that occurred just before the successful conclusion of this Kickstarter. We’re very proud to announce that the final amount raised cleared one of the most anticipated stretch goals: a fully explorable overworld. The fact that we can now use this traditional JRPG feature in Project Phoenix brings us that much closer to what we feel will be a truly authentic experience as you explore Azuregard in all its breadth and glory. Furthermore, we’ll be working on more seamless transitions to combat from the overworld map to maintain immersion as you explore and battle your way across Azuregard. The Kickstarter is over, but the journey has just begun. You can still support! If you missed out on supporting us during this Kickstarter period, please be aware that you can still back the project and receive all relevant goodies via our Paypal store located here: http://projectphoenix.info/store/. More importantly, they’ll still count for stretch goals, so we’ll be sure to continually update on the total amounts we’ve received and what that means for us being able to broaden your gameplay experience! As you can see from all the updates thus far, all the questions asked and answered and all the very talented people involved, we’re going to be extremely busy in the months ahead. We humbly ask that you understand that we are, despite the massive task ahead, a rather small team. It may take us some time to process all of the pledges, but please be aware that each and every backer of Project Phoenix made this possible. While the Kickstarter might be over, we’ll continue to post news and information both here and on the official website. On behalf of Ruffles, Marcus, Sylrianah, Zarum, Satsuki, Gorek and all the many people on Azuregard that you've brought to life through your passion and enthusiasm: we’re so glad you’ve decided to come along on the journey with us. When we launched Project Phoenix, our stated goal was to raise a sufficient amount so that Steffen Unger and his team, who have worked on games as Crysis 3 and Halo 4, could work on Project Phoenix’s 3D models. After all, we were aiming high and we wanted the quality of the characters to be reflective of our vision. With the end of the Kickstarter campaign, Steffen and his team will be hard at work creating and polishing the character models to perfection. So far, they’ve been able to translate the character designs for Ruffles and release a work-in-progress model of her in a turntable format.So click on the video below and let us know what you think! Ouch.... Thanks for the update and all but please reupload the video of ruffles without this peeeeeeeeeeeeeeeeeeeeeeeeeeeeeeeeeeeeeeeeeeeeeeeeeeeeeeeeeeeeeeeeeeeeeep. I think it destroys headphones. Don't get me wrong, I love this design but what really drew me in to this project was how GONTARO brought these characters to life with his art style. Would really love to see his designs come to life in the game but I guess that's a little too ambitious at the moment. Ruffles likes to imitate things. Last week she imitated a computer having startup problems. She turned in a circle for five hours going: "beeeeeeeeeeep." But no, seriously, this looks great! What's wrong with their nose? Get rid of their noses and I shall be satisfied. I thought the same thing about the hands when I first saw them. But the model is chibi-like and since it's still a first draft, I was like "eh no biggy." I love her! Something is very slightly off with the hands. Maybe it's the wrist? Or the transition from arm to hand. Idk. But I really like it as is, just leaving feedback. Hands a little too big for my taste tought. I can´t wait to see more! I think once you start showing actual game play in the coming months that you'll be able to get the funds for the other tiers. Chibi character doesn't have feet guys. It's really cute and well made, not too much moe blob, just perfect. The hands are a bit big though. Great looking character model of Ruffles! Really excited to see some of the more mature looking characters in this fashion as well! Congrats on the Overworld stretch goal. I don't think a JRPG would feel the same without an EPIC overworld to explore. So excited for more information on this game. Very nice ! The details are something I really appriciate. Keep on the good work, we have faith in you guys ! A fully explorable overworld! This is amazing to hear. The model sample looks great so far. I'm stoked we passed that last milestone. Explorable overworld is a key component to getting that traditional JRPG feel. So, why isn't it 2015 yet? Also, people, above the turntable clip, Ruffle's model is considered a "work-in-progress". It's not the final product. Ruffles! :D Looks great. Can't wait for updates in the future. Congratulations on all the support you've received. It was awesome to see you break 1 million and then bust through that stretch goal late on the last night of funding. Should strong support continue via PayPal, I hope you all are able to work out that next stretch goal and get the game's soundtrack fully orchestrated. Ruffles' model looks very cute, and I like the detail on the back of her dress and her diadem. Because the tones on her model are all so light and pale, however, it might be difficult to make out that detail at a glance in-game. You might need to put greater emphasis on the outline of shapes, or maybe this won't be an issue in harsher lighting or against a darker background. Hope this is just concept looking forward to full character models not chibi stuff. I'm very happy for the project's success! I wish good luck in the next months! As a Pionner backer, I'll wait patiently for the game's launch! Since the very begin I knew this gonna be and amazing experience and a success experience! Keep going, ladies and gentlemen! Congrats on so much getting raised. And good luck on the long road ahead of making this game a reality. The work-in progress Ruffles looks great. 3D Ruffles is adorable. I want a figure of -her-. for a WIP this looks awesome... better than alot of other people's finished work lol Knowing that this already looks good with plenty of potential for improvement has me beyond excited. Good job!! And awesome model too ! I can't wait to see the next updates ;-). Awesome! Despite your small team, you are producing work the day after the kickstarter campaign. :) We look forward to what lies ahead, and as always, let your backers know how they can help. Man that is awesome, now it's the time to wait for future updates and to all in the Team... Congratulations! finally an in-game wip sneak peek! it's really awesome Ruffles comin' out good! This looks great, you guys! Charming as heck; soft, clean texture work and perfectly capture the art style of the cute lil' avatars. It's going to be great to see all the other art that the 3D team comes up with in the months and year (or so) ahead. from what i understand... tiers will be limited and removed soon (where sold out). KS-exclusive goodies will also be removed soon. As they are a small team, it'll take them a few more days (probably) to make the changes on PayPal. Is this the chibi version? I want her figurine plz. I'm OK with this model. I like this style, proportion of body and color shading. Does something likes hair, dress, etc. has movement while she walks or runs? I'm a bit confused about the goodies. Weren't some of them limited as Kickstarter exclusives? Hey @CIA does that mean that the pledge tiers are not limited after all since people can keep pledging on Paypal? The journey of waiting dost surely beginz! Make this game GREAT! Go Project Phoenix! Congrats! I pledged a dollar to follow the project. Once you offer PS4/Vita versions (preferably bundled with the soundtrack and artbook) I'll be throwing my money at your paypal. I hope that comes sooner than later. Is the render in a very (too much) lightened scenario, or the character lacks of contrast and some colors?